Portable beam anchor fits I-beam flanges from 4" to 12" wide and up to 1" thick. allowing for quick and easy attachment to the beam. Utilizes a pivoting D-ring assembly for connection of deceleration device. •Rugged stainless steel construction resists corrosion and is rated at over 5,000 lbs. •Ideal for overhead I-beam structures. 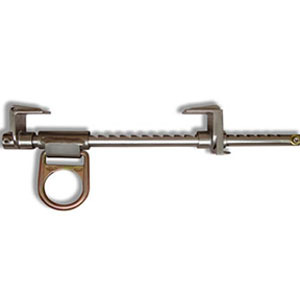 •Ratcheting mechanism provides a positive lock and ease of installation.